"Welcome to Washington Heights, where life's a struggle but the streets are jumping to the irresistible rhythms of love, passion, hopes and dreams. This smash-hit, Tony Award-winning musical is a joyously uplifting tale of young love in a community on the brink of change, set in one bustling neighbourhood where everyone knows everybody, and the breeze carries the sweet sounds of three generations of music. 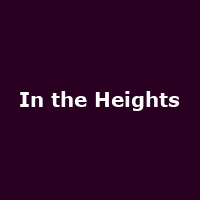 Back to spice up London following its hugely acclaimed, sell-out season at the Southwark Playhouse, In The Heights is a thrilling evening of unforgettable songs and amazing choreography infused with the scorching rhythms and vibrant energy of a Manhattan heatwave. A word-of-mouth sensation on Broadway that had audiences coming back time and time again, this life-affirming story will enthral and delight audiences of all ages."